If ALL of you that have had DUNK build or re-finish your rifles could gather or take some PICS PLEASE post them here.. Mebe add a few words about the rifle and how she shoots.... Heck maybe even post a LINK to a previous reveiw you did when the rifle was returned to you? Yesterday was range day for me, several of us get together every two weeks and shoot.. With all that's been going on I felt it was the perfect time to bring the S/A FAL DUNK did for me.. As usual the gun ran perfectly and she is a great shooter... From the very first round the rifle has functioned perfectly and I am pleased to be the owner of one of Rogers rifles.. I would like to ask the MODS to quickly remove an BILE spewed in this thread. If a someone doesn't like what being posted here then he can simply ignore it and move on..
Great idea! A nice tribute to Dunk's contribution to our FAL community. And a group picture. 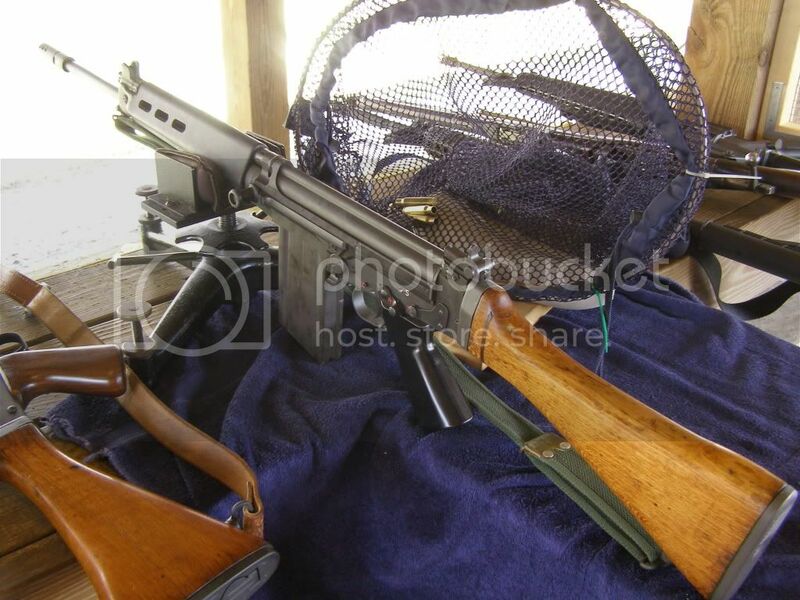 Dunk built Belgian FALO, black Para, Wood Para, all 3 Israeli clones, both G1's, and the bottom STG58. Last edited by davesrb; January 14, 2018 at 08:22. All I have is a barrel! Dunk built my first FAL. 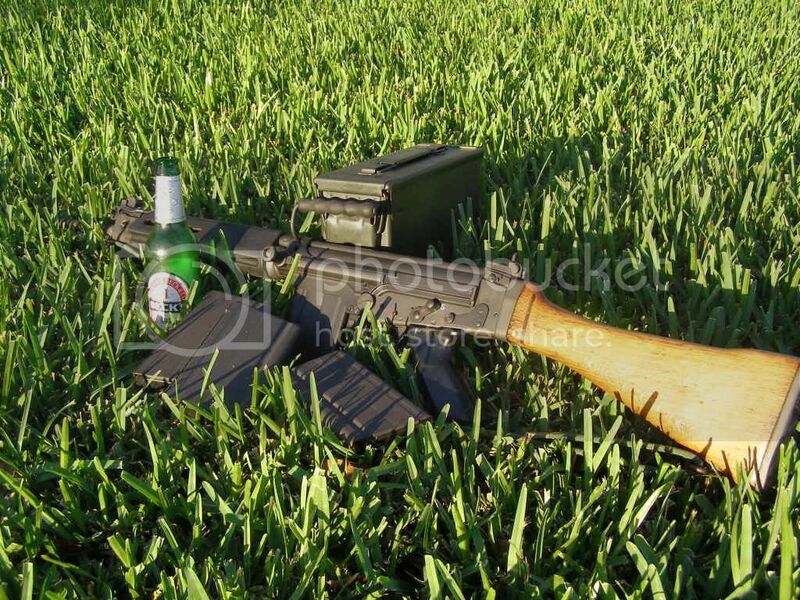 We have been talking about him building me another, I have the DSA receiver and a Rhodie kit....now I will have to wait. This rifle was built on an old Imbel kit I had laying around forever. I finally got around to having it built and found Roger here on the board. It shoots dead on with open sights at 50 and 100 yards and functions flawlessly. God rest your soul my friend. Last edited by SPEEDGUNNER; May 14, 2010 at 17:40. DYNOMIKE, GREAT IDEA Thank YOU!!! 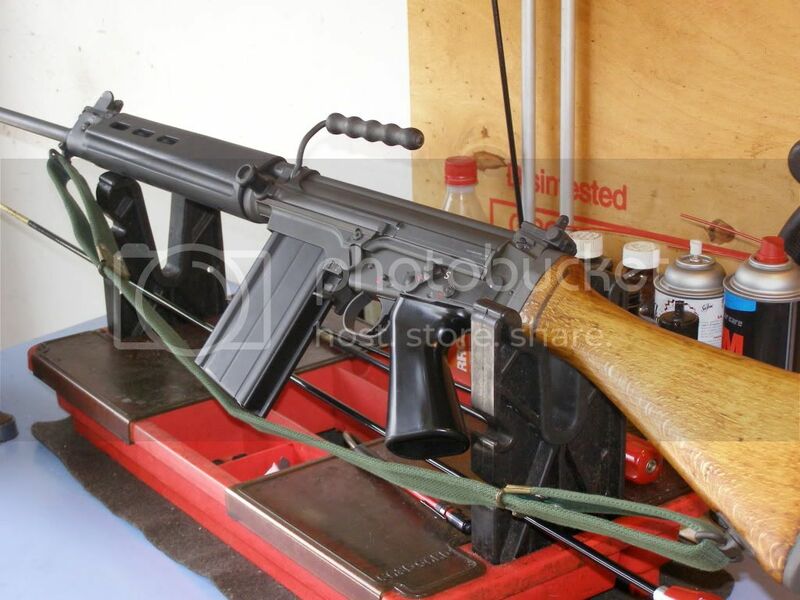 Of a few that I now own, this was not only the first one that Dunk built for me BUT the first FAL that I ever owned! She shoots 1 moa ANY day of the week with Aussie ammo! And I have yet to have a FTF or FTE with over 3K rounds thru her now! PS: he is also working on a STG for me now, when he gets home he will have to get started back on it. So get well DUNK we need you here, in the shop and as we discussed last Friday April 30th YOU and I have a date at Knob Creek in April 2011! GET WELL SOON OLE BOY!! I will get some up tomorrow. Brownknees saw one recently at the show in York. Always been very happy with Dunks' work. RIP. Last edited by grullohorse; May 15, 2010 at 20:14. The man built some beautiful rifles......no doubt. Edit: For some odd reason, I like that Rhodie in the post above. You all have some very, very nice Rifles! He did some fine work. Say what you mean and mean what you say. Those who are silent are understood to consent. Here's one. Haven't had time to take pics of the other three. Dang, he did SO many nice things for me too. 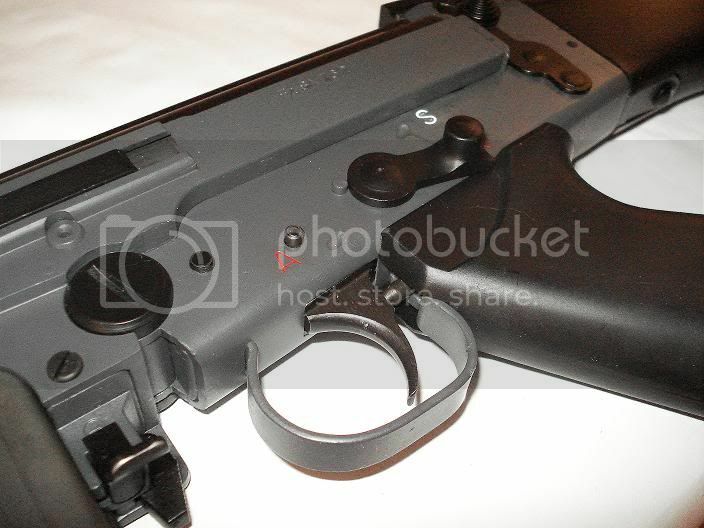 I had a mismatched kit, Imbel lower, STG front end. I sent him the kit, he asked me if I was interested in making it all STG. I said sure , how much?? Even steven trade. Perfect. Another kit was missing the Gas Tube thingy. I asked him how much to supply one, he replied, "don't worry about it". I tried to fight him , he was not biting. Another time , he was a week behind on delivery date, I just asked him when I might expect the gun. (he had to order a locking shoulder). When it was only a week behind, and I asked about how much additional for the locking shoulder, he replied "Merry Christmas Doug, no charge!" Yes, I will miss him a lot!!! When I was building my OWN, he called me and gave me free advise. A very nice conversation, sad I never got to meet him in person. Double click image to enlarge, hover image, and double click. Nice!! Cheers to you Dunk!! Missed greatly already, and always. What's happened? I thought Dunk is recovering from the illness he had. I didn't know Dunk personally, but some emails exchange. Life is such a fragile thing. I'm speechless. Great idea Dynomike, thanks.We miss you Dunk, sorry I did not get to meet you personally.Here is my Argy from a Sarco kit and truly a tribute to his work. It was the 1st of these kits he had built and really enjoyed the build. He had about finished up my Argy Para build before he got sick....can't wait to get it back, will post it when it arrives. Roger loved this Image Section of the FalFiles. Several times recently he'd call to check up on me and point me to this very Image Section for one of his builds or some of his refinish work that some happy customer posted up. I hope All of us whom have been touched by Rogers work dig up all those Images he was so proud of and post them here. Please do this the best you can guys. Id love to copy the images and make a Image Collection Disc of Rogers work. Id offer copies of the disc to anyone who wanted one for free in Rogers honor. So long as I can hold out I will. FAL - PAC IMBEL Gear Logo Virgin Rcvr, Bocefus 95% IMBEL Kit, Duracoat Grey Wolf, Duracoat HK Blk accents. Real IMBEL Imported HGs. FSE compliance parts...HTS/PG/Piston/Combo device (all FSE). US stock. Roger and I spent a long time hashing this one out. And when he went to put it together he said it went real easy and smooth. A true Cherry of a gun in every way. We called it the IMBEL on IMBEL for reference. Last edited by DarkEarth; May 23, 2010 at 15:06. Never did get a chance to have Dunk build one for me, His builds looked really nice with attention to detail for sure. Roger if your looking down on your builds and the friends you made, Your work will live on in mind and spirit. RIP Dunk. Dave I sure do miss OUR FRIEND!! Hold his memories close to you always!! He spoke very highly of you as a GREAT MAN!!! He is now and will always be missed!!! It would be nice if people who had posted pictures here could re post them! I don't have the privilege of owning a rifle that Dunk built but I've handled(and drooled) on a few and he did some impressive work. 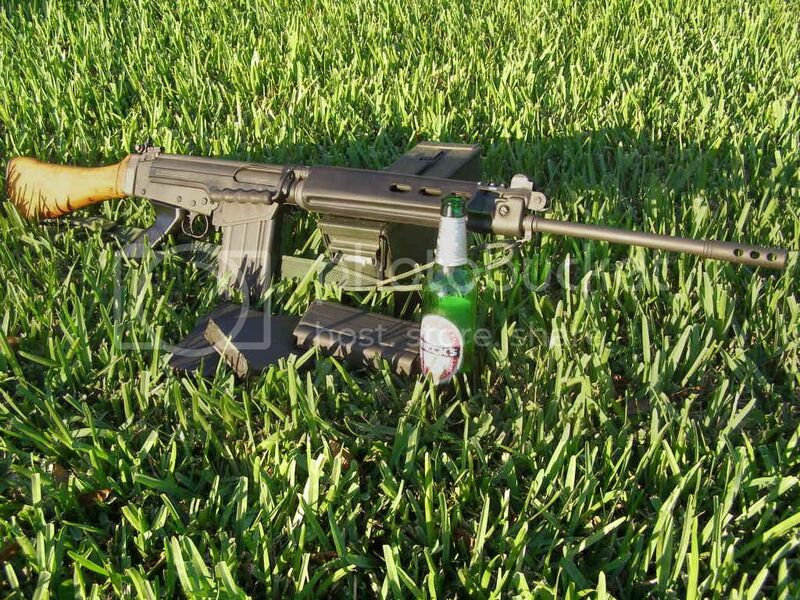 Beautiful FAL's in this thread guys. He built 2 Aussies for me. Roger was a very interesting guy. I had the distinct honor to consider him my friend. He would be happy to know that people still enjoy his builds and admire his workmanship.